In December, Roman Catholics prayed the rosary in a program they have called “Rosary on the Borders” in order to protect the United States from terrorism. 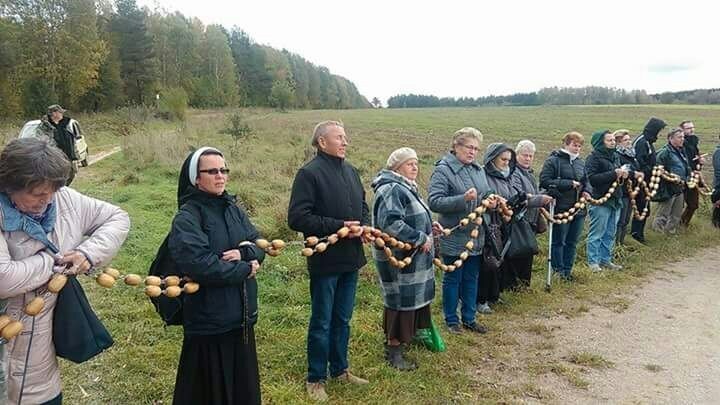 The prayer initiative was taken from the Rosary on the Borders in Poland, in which Papists gathered on the two thousand mile border and prayed for protection of their nation last October. Now, the British will gather to pray the superstitious incantation of the rosary to their false god. The superstitious prayer event is planned for Sunday, April 29, and organizers say the mass-rosary prayer will help combat the “present threats to faith, the dignity of the human person and to peace,” and encourage a “re-flourishing of our Faith.” So then, Papists will gather on the various coasts of England, Ireland, and Wales and hold their religious enchantment charms and repeat their incantations. Again, organizers hope Catholics will gather not just on the coast of the British mainland but also on surrounding islands including Orkney, Shetland, the Hebrides, the Isle of Man, the Isle of Wight and the Channel Islands, believing that practice will supernaturally end abortion. Roman Catholics take the same idolatrous, superstitious approach to ministering at abortion clinics, as they typically stand on the street mumbling their prayers to their dead woman. While their faith is commendable, the object of their faith is an idol, and cannot justify or make any eternal or temporal difference. In fact, the Scripture explicitly tells us not to vainly repeat prayers, because this is a pagan practice.